Cats: like Marmite, Kanye West and reality TV they tend to polarise opinions. To detractors they’re cold, calculating, sinister beings who use humans for food and attention. 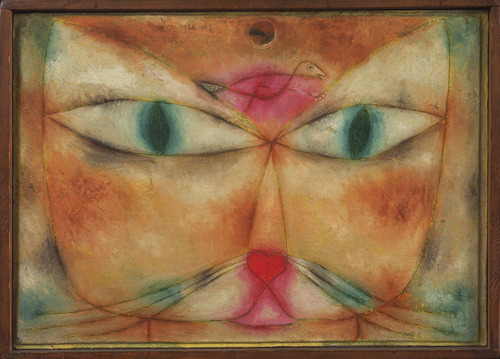 To cat lovers, the very traits that irk the haters – their cool countenance, air of superiority and unwillingness to be stroked if not in the mood – are all signs of character, which opposes the dogged subservience of their canine rivals (to the cat lover, dogs are just a little too…eager to please). 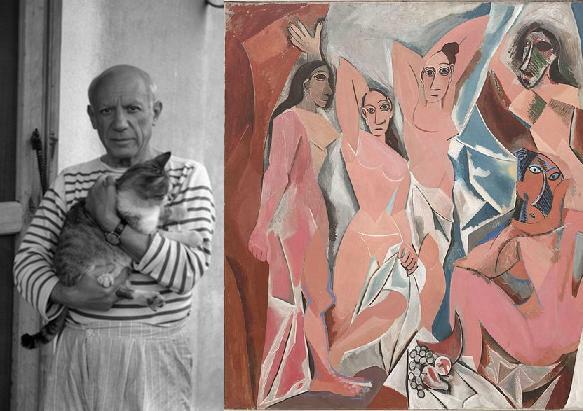 Right: Could Picasso’s masterpiece and disputed inspiration for the Cubist and Modern Art movements itself have been inspired by a cat? Oil on Canvas (244 x 234 cm). And then of course there’s the Egyptians. Can you imagine the Pharaohs (and their thousands of slaves of course) going to all the effort of hauling tonne upon tonne of rock on top of each other (without a single crane in sight), and then carving said rock with their bare hands, to create a stone monument of a woman’s head perched atop the body of a bugle or a sausage dog? (‘ just doesn’t work, does it?) And that’s not to mention the scores of statues, carvings and engravings dedicated to them. Cats back then weren’t just revered, they were worshipped. Reportedly from Saqqara, Egypt. Late Period to Ptolemaic Period, Dynasty 26 or later, circa 664–30 B.C.E. Bronze, solid-cast and wood, 6.1 x 8.8 x 5 cm. 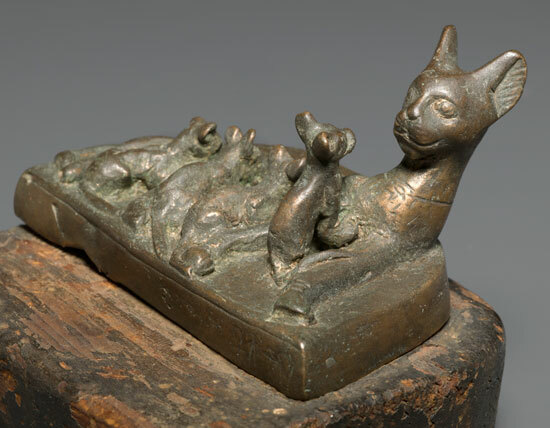 For proof of the Egyptians’ love for cats the Brooklyn Museum has a permanent exhibition of carvings and statues called Divine Felines: Cats of Ancient Egypt; cat lovers in the area can show their allegiance by stopping by. For all you non-Brooklynites, you can side with fellow feline fans by picking up a copy of any of the following ebooks: Picasso; Klee; Klimt; Dali; Bonnard.